'Untitled Landscape', 2014. Installation at Orford Ness. Photo by Owain Thomas. Bee Composed, by Lily Hunter Green. 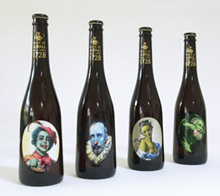 Aspall Cyder Beautiful labels by Glenn Brown. The opening hours are midday until the start of the evening concert during this period. The works will be installed at Snape Maltings until the end of August 2015. Please refer to this noticeboard for opening times after the 28th. Please note that outdoor works can be viewed at all times. Abigail Lane together with Aldeburgh Music has selected works by three contemporary artists to be installed at Snape Maltings for the period of the Aldeburgh Festival, 2015. Each work has been chosen for a specific and relevant site. 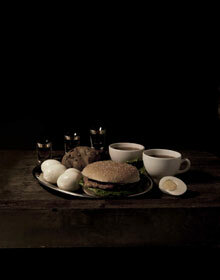 Mat Collishaw’s still lives, a series of framed prints each titled Last Meal on Death Row, 2012, will hang in the Concert Hall Gallery, between the concert hall and the bar/ restaurant. His work Whispering Weeds will be positioned in the Dovecote Studio close to the reed beds. Damián Ortega’s work, Through /True Stone, 2012, will be on the Hepworth Lawn in proximity to Barbara Hepworth’s permanently sited work, The Family of Man. Roman Standard, 2005, a bronze sculpture by Tracey Emin - a tiny bird atop a 13ft pole, will be installed near to the estuary and it’s famous ornithological habitat. Preparations are underway for an ambitious project for SNAP Art at the Aldeburgh Festival 2016. We propose to exhibit works by a number of artists in private homes, public and possibly commercial venues within the village of Snape. Watch this space! NEW LARGE SCALE PHOTOGRAPHIC WORKS BY ANYA GALLACCIO produced for the 4th annual exhibition of SNAP Art at the Aldeburgh Festival. Specially commissioned by Aldeburgh Music, 14-18 NOW and with the support of the National Trust, the installations will be at Snape Maltings and Orford Ness. Tours to Orford Ness by appointment. See full details and map here. Anya Gallaccio has been commissioned to create new works inspired by some of the earliest experiments in aerial photography and the air bombing tests that took place during World War One on the harsh landscape of Orford Ness, which is a remote shingle spit on the Suffolk coast, 6 miles from Snape Maltings – home to the Aldeburgh festival. Her installations at both locations will comprise of images made using extreme magnification to depict the inner landscapes of imploded material taken from the site of those early experiments. Now an unusual National Trust nature reserve, Orford Ness has a mysterious military past that has resulted in a landscape formed of strange derelict buildings and debris as well as the huge reserve of vegetated shingle for which it is famous. Orford Ness is an extraordinary place that is constantly changing and eroding – it has qualities that are at the heart of Anya’s art. Her works are frequently transient, beautiful, sometimes strange and unruly. For more information about this see here. Bee Composed. 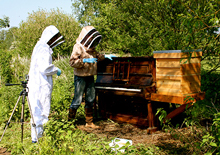 A piano and a hive of bees. Bee Composed is an audio-visual art installation comprised of an upright piano, which has two beehive-like structures emerging from its top corners. Projected within the hive-like structures, film footage will simulate the activity of bees. The footage will be taken directly from a second piano, located close by but not accessible to visitors. The artist will have established this concurrently as a working and active beehive. 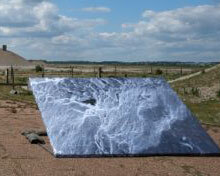 It will be located on the Henry Moore Lawn at Snape Maltings for the duration of SNAP 2014. Lily Hunter Green is a sound installation artist and contemporary composer who lives and works between Brighton and Suffolk. For more information about this see here. In the last two years SNAP was delighted to collaborate with Aspall Cyder. Five fabulous limited edition artist bottles, using images by internationally renowned artists Glenn Brown and Ryan Gander were produced in 2012. Last year to celebrate the Britten centenary, Aspall again produced a collectibles series featuring four Britten-inspired Maggi Hambling bottle labels derived from her works in the SNAP 2013 exhibition. The Festival of Britten Still Suffolk Cyder was launched on 8th June at SNAP Art at the Aldeburgh Festival. For details visit www.aspall.co.uk. For SNAP 2014, we are pleased to announce the continued support and sponsorship by Aspall Cyder. 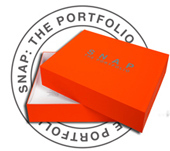 In 2011 and 2012 Paul Stolper gallery worked in collaboration with SNAP to produce 2 fabulous and unusual artist print Portfolios. All artists from the 2011 and 2012 exhibitions contributed and both box sets are available from Paul Stolper gallery. The prints were shown as part of the SNAP exhibitions at Snape Maltings in their respective years. The portfolios have also been shown at a number of other venues in London and abroad – most recently at ESPACIO MÍNIMO gallery in Madrid. SNAP The 2011 Portfolio. Exhibition of 12 prints, 14th September – 9th November 2013,Espacio Minimo galleria de arte Contemporaneo, Doctor Fourquet, 17, Madrid 28012 Spain. For details of the prints, artists, availability and other venues where they have been exhibited, please click on the portfolio icon and follow the links. Polite has produced a beautiful box set of postcards, reproducing artist’s images from the 2011 SNAP Portfolio. These include Darren Almond, Don Brown, Mark Fuller, Russell Haswell, Gary Hume, Abigail Lane, Simon Liddiment, Sarah Lucas, Johnnie Shand Kydd, Julian Simmons, Juergen Teller and Cerith Wyn Evans. Please click here for details and a list of stockists. Two unique collections of large scale prints. Published and For Sale at Paul Stolper Gallery.